Ferrol, which is also known as El Ferrol, is located off the Atlantic coast in the province of La Coruna, northwest Spain. It has been a major shipbuilding centre since the 18th century and is still a naval port today. So if you have an interest in battle ships, there are plenty to view albeit from a distance! The old part of town is the Magdalena neighbourhood. There is not a great deal of ancient architecture left in Ferrol, but you can at least explore the 18th century Cathedral of San Julian designed by the architect, Sanchez Bort, and the Church of San Francisco. The church was built during the same period as the cathedral, and became a military church when church properties were eventually seized throughout Spain and handed over to the Navy. It shared a role in watching over the dockyards. 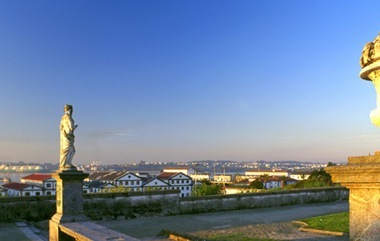 Beyond Ferrol, no more than 15 minutes away, is the magnificent Castello de San Felipe which stands above the bay. There is an excellent tour that guides you through the castle, which even the children will enjoy. The castle itself was built in 1598 and was way ahead of its time in design. Apparently the walls of the castle were never breached during battle, and today they still hold an annual celebration to honour its victory in holding off an attack by the British. Another special place to visit is the Monfero Monastery. The original site dates back to the 10th century but was destroyed by the Normans. King Alfonso VII decided to rebuilt it in 1124, and further renovations were carried out during the 17th century. The main aspects include a church, side chapels, baptistery, three cloisters and a chapter house. The church was constructed in 1622 with a single long nave of a Latin cross, and is still used today as a parish church. Inside are a number of interesting tombs, one containing the remains of the 15th century nobleman, Nuno Freire de Andrade, otherwise known as ‘O Mao’ (The Bad). The charming medieval fishing town of Pontedeume is on route to the Nature Park of Fragas do Eume. The town has a promenade that runs along the estuary, and the stone bridge that crosses the Eume River has no less than 68 arches. The current bridge replaced the original one built in 1380 which had two watch towers, a chapel and a pilgrim’s hospital in the middle. If you visit Pontedeume on a Saturday morning, you will get to experience a typical Galicia market, selling all sorts of interesting delicacies. The most interesting monuments to visit while you are there are the San Martin de Andrade and San Miguel de Breamo churches, as well as the Andrade Palace-Fortress. However, all that remains of the 14th century palace is the Andrade Torre del Homenaje which was the original keep. The Nature Park of Fragas do Eume is magnificent forest covering an area of 9,125 hectares, with hiking and biking trails throughout. It is home to many endangered species of flora, several picturesque little towns, and outstanding medieval buildings. It also acts as a sanctuary for the protection of rare birds such as Eagle Owls and Peregrine Falcons. Ferrol is surrounded by beaches and the most popular ones are San Jorge, Cabanas and Cobas. However for windsurfing, Dominos is best with its crystal clear water and strong waves. Whereas Esmelle is more suitable beach for surfing. Above the town overlooking the Ria of Ferrol is the Parador Hotel Ferrol, formerly a Galician manor house. This three star hotel has a very nautical theme which is very much in keeping with the harbour town. Many of the rooms have lovely views of the port below, and there is an excellent restaurant serving typical Galician dishes. Festivals of course always add to the occasion, so if you are fortunate enough to be there in January you will be able to enjoy the Feast of San Julian, in honour of the town’s patron saint. During Easter is the Nuestra Senora de Chamorro, and later in the summer around August is the Feast of Amboage.